The world-famous International Pilgrim Virgin Statue of Our Lady of Fatima was sculpted in 1947 by Jose Thedim, based on the description of Sr. Lucia, one of the three young seers who saw Our Lady each month from May to October 1917 in Fatima, Portugal. On May 13, 1947, in the presence of some 150,000 pilgrims, the statue was blessed by the Bishop of Leiria at Fatima to be the pilgrim, the traveler. Sent out to bring the Message of Fatima to the world, it began its journeys. The Peace Plan from Heaven is a call for prayer and penance offered in reparation for sin. Our Lady said at Fatima, "War is a punishment for sin." She asks for Communions of Reparation on the First Saturday of the month and that we daily offer up each act as a sacrifice for sin, pray the Rosary, be consecrated to Her Immaculate Heart, and wear the Brown Scapular as a sign of this consecration. On October 24th, 1952, the Holy Father, Pope Pius XII, graciously granted an audience to three priests of the Scarboro Foreign Mission Society: Rev. D. Stringer, Very Rev. A. Chafe, Vicar General, and Rt. Rev. Wm. C. McGrath, custodian and Director of the Pilgrim Virgin Tour. After blessing the Pilgrim Virgin Statue, His Holiness imparted a special blessing to the work of the Society and to the Fatima Pilgrimage. Before Cardinal Karol Wojtyla was our Pope, at the Eucharistic Congress in Philadelphia on Aug. 13, 1976, he declared: "We are now standing in the face of the greatest historical confrontation humanity has gone through... We are now facing the final confrontation between the Church and the anti-Church, of the Gospel and the anti-Gospel." That is still true today. On October 31, 2001, a truly great man of world-wide renown, John Mathias Haffert, passed peacefully from this life, praying his Rosary, in the presence of the International Pilgrim Virgin Statue of Our Lady of Fatima. It was appropriate that he die during October, the month of the Holy Rosary. 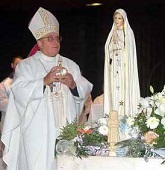 His life was dedicated to promoting the Message of Our Lady of Fatima and the related Brown Scapular devotion. He was the Founder of the International Pilgrim Virgin Statue Foundation and the Co-Founder of the Blue Army of Our Lady of Fatima. "I promise to assist them at the hour of death, with all graces necessary for the salvation of their souls." On June 13, 1917, Lucia asked the Blessed Virgin to lead them to Heaven. 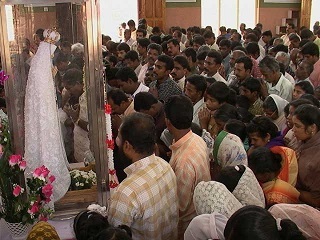 The Blessed Virgin answered: "Yes, I will lead Jacinta and Francisco there soon. But you (Lucia) will remain here some time longer. JESUS WANTS TO USE YOU TO MAKE ME KNOWN AND LOVED. HE WANTS TO ESTABLISH IN THE WORLD DEVOTION TO MY IMMACULATE HEART (Through the Five First Saturdays.) I PROMISE SALVATION TO THOSE WHO ADOPT THIS DEVOTION AND THE SOULS WHO PRACTICE IT (The Five First Saturdays) WILL BE BELOVED OF GOD. THEY WILL BE AS FLOWERS PLACED BY ME ADORNING HIS THRONE." A powerful little booklet explains the requests of Fatima, and how to fulfill them. The message of Our Lady of Fatima is for all mankind, and it is just as cogent and important in our day as when it was first given in 1917. Many people the world over have never even heard about Our Lady's crucial apparition at Fatima, let alone read her message. Become an apostle of Our Lady by distributing this inexpensive but powerful little booklet. Hell exists, and we might go there. Bob and Karen Kirsch of Saint Benedict Parish in Carrolltown request the intercession of the Blessed Virgin Mary, as the International Pilgrim Virgin of Fatima statue visited the site of the September 11, 2001 crash of Flight 93 in Shanksville, Somerset County. "I feel sad," said Karen, looking out over the field where the plane went down. "It shows how people gave up their lives for people they didnt know," she said. Bob was equally moved, noting "You wonder what they could have been thinking before the plane hit the ground."